When Boom Boom Warshawski, a former star player for the Chicago Black Hawks, takes a tumble from a wharf and is chewed up by a ship’s propeller, his cousin V.I. refuses to accept the death was accidental. Although his ankle was weak, he’d left a message on her phone asking to talk to her about his new job. As a private investigator, V.I. Warshawski is used to digging around to discover the truth and her questioning takes her into the world of Great Lakes shipping and the cut-throat business of logistics. With strong personal rivalries and large sums of money at stake there’s plenty of potential reasons and suspects for Boom Boom’s death. And it’s clear that someone does not want V.I. to discover the truth. 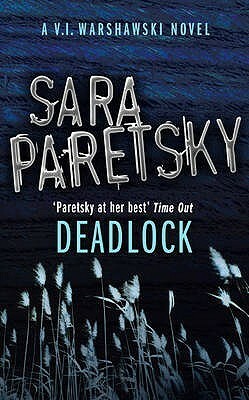 Deadlock is the second book in the popular V.I. Warshawski series that presently has seventeen instalments. The story is engaging and there’s plenty of action throughout. However, I struggled with the plot devices used to propel the tale along. V.I. Warshawski’s modus operandi in Deadlock is largely the bull in the china shop approach, thrashing around unsubtly to see what emerges, and she fails to document anything or confide in anyone and seems largely immune to the fate of others (such as collateral deaths and job losses) as long as she solves the initial case. The cops are stupid and obstinate and refuse to either listen to V.I. or join the dots between cases that are obviously linked and are clearly not accidents. The credibility of both sets of investigations is pretty much nil, but enable V.I. to barrel her way through a set of scrapes as she seeks the identity of the killer. On the other hand, it’s nonetheless an entertaining jaunt, with an interesting context in terms of the Great Lakes shipping industry. As long as you can suspend disbelief it’ll pass a few hours. Great review Rob! I read the first 4 or 5 books in this series years ago but haven't read any more of them. The writing and stories were too mediocre for me to continue with this series. Lots of holes, as you pointed out, in the story. Although as a hockey fan, I did like the hockey angle in this book. Thanks again for the terrific review, you nailed it with your impressions. Keep up the hard work!